Ever heard the saying, “If you keep having the same problem, you’re the problem?” Yep. That’s true. Wherever I go, there I am. I’m a health coach but I’m also human. Just when I think I’ve figured everything out, another episode of Groundhog Day starts in a familiar fog of deja’ vu. It’s not easy to live and learn at the same time. Training to be a health coach has opened my eyes to a whole new way (new to me, not necessarily anyone else) of dealing with the darker aspects of myself. I used to assume that healing requires insight to the root cause of an issue. But I’ve learned that understanding why something is wrong doesn’t change what is wrong. Explanations don’t produce change. We can spend a lot of money to have a doctor tell us what’s wrong. We can spend even more to have a therapist tell us why it’s wrong. Or we can let go of the cause and work on the solution. 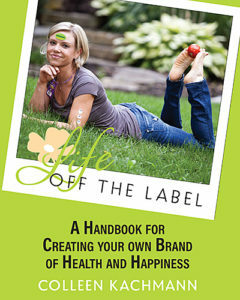 Let me share a wee-bit-too personal story of how health coaching worked for me. In the fall of 2015, I fell into a post-marathon funk. I hadn’t actually run a marathon, but a finish line had been crossed. My book was finally sent to the publisher. And during the three years it had taken me to finish it, I had gone through a divorce, moved with my four children, remarried and inherited three stepchildren. After many intense struggles, highs and lows, my life down-shifted from chaos into peace overnight. But I don’t do peace very well. Survival mode is motivating, albeit stressful. With no more fires to fight, I was at a loss for what to do next. There was no “normal” to get back to—too much had changed. So I enrolled in a health coaching certification program, hoping that furthering my education would help me figure out what came next. What came next was winter–both actual and proverbial. Despite the fact that nothing was wrong—everything was actually right!—I felt stagnant and depressed. I’d go days without leaving the house. I slept too little, drank too much and forgot to work out. My sense of self and self-esteem seemed out of reach. The health-coaching program proved to be a lifeline. In learning how to help others caught in their own spirals of descent, I was given the tools to help myself. And it was unlike any intervention I might have predicted. I had assumed that since there was nothing wrong in my life, the problem must be me. Crap . . . wherever I go, there I am. But there was something wrong in my life. Looking at it from a holistic view helped me to see living in survival mode had allowed me to neglect other areas of my life. When survival mode ended, I was dazed and confused because I thrive on community and connection. Without those, I stop thriving. Health and happiness are inextricably linked, and require balance in all facets of life–not just the areas we prefer to focus on at the expense of the others. 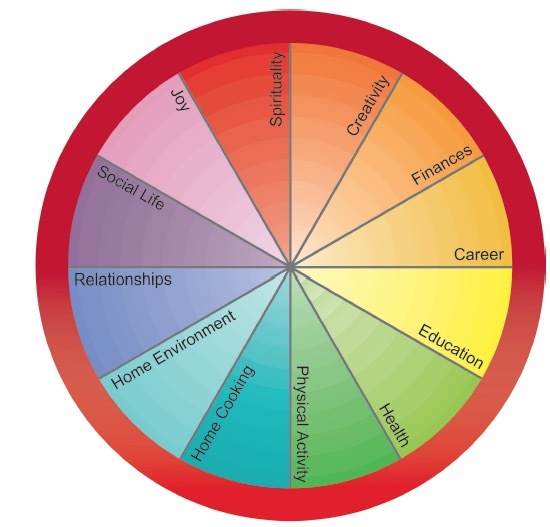 The epiphany came with an activity called the Wellness Wheel. 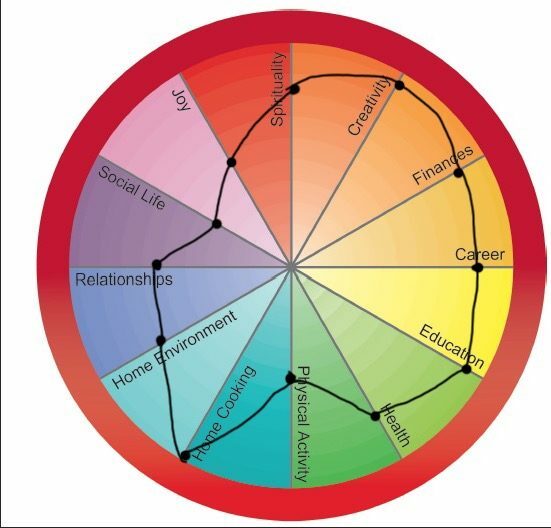 There are 12 domains, each represented by a spoke in the wheel. I rated my satisfaction in each domain. It was immediately obvious why I wasn’t rolling steady through life like I should be. My wheel had a flat. But the good news is that it was just a flat–not a fatal flaw in my character or mental health. The darkness was simply a lack of light. Awareness led to action. I visualized what my ideal and balanced life would look like. Each week, I set SMART goals (specific, measurable, attainable, realistic and timely). Baby steps propelled me from my (dis)comfort zone. Soon it was spring—both real and proverbial. Had I stuck with the assumption there was something wrong with me, the shame and guilt of my pathetic state would have perpetuated the cycle in which I was stuck. This is the beauty of health coaching. We don’t focus on what has brought you down. We focus on what will bring you up. The negative circumstances holding you back don’t matter nearly as much as the strengths and values that will move you forward. Healthy habits and happy feelings are far more rewarding than doom and gloom. Eventually the bad behaviors get “crowded out.” Balance is the most powerful anti-depressant. Health coaching strives to solve problems so that they stay solved. Because life is full of curve balls. Accepting responsibility for your own wellness allows you to take corrective action instead of waiting around for rescue. There is always something you can do to improve today. And every something you do adds up to an even better tomorrow. I’m a health coach, and I’m human. Groundhog Day episodes are part of my struggle. But when I find myself stuck in repeat mode, I need only to remember that there is nothing wrong with me that I can’t handle. I’ve simply put too much emphasis in one area of my life at the expense of the others. Darkness is a lack of light! Actions that restore balance turn on the light. Challenge accepted. Game on . . . Interested in health coaching? Read more about working with me . . .